Welding is the truly dangerous occupation and it requires proper care and protection. Because the workers are subjected to sparks, toxic films, and many other injuries. In 1930 the first welding helmet has been introduced in order to provide protection for the welders. Before that people use to make use of different face mask and goggles in order to protect themselves from sparkles. After that, the mainstream industrialization has come up with an idea to provide complete safety. Then the actual shape of the helmet with lenses took place. It not only provides you from the ultraviolet radiations but also eliminates the overall effect of UV radiation especially on the welders. It is too good to be true that Hornell is the first Swedish manufacturing company who came up with world’s first auto darkening helmet. With the invention of this helmet, the market has become alert and everyone started focusing on it. Moreover, it has also concentrated on safety thereby providing the best protection in terms of everything. This has drastically increased the selling point of this type of helmets. 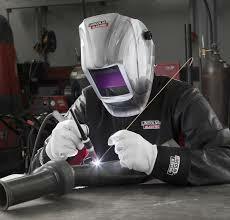 Later on, new technologies started taking place and you are now experiencing lightweight welding helmet as well. As the technology keeps on changing from day to day you will be experiencing much more advanced helmets. However, the era of helmets has completely changed the way in which you are provided protection. In addition to that love, we are experiencing much more advanced helmets including auto darkening, mode setting, and many more.